The Nehru Family is an Indian political family that has occupied a prominent place in the politics of India. The involvement of the family has traditionally revolved around the Indian National Congress, as various members have traditionally led the party. Three members of the family — Jawaharlal Nehru, Indira Gandhi, and Rajiv Gandhi have served as the Prime Minister of India, while several others have been members of the parliament. Indira Gandhi, Jawaharlal Nehru, Rajiv Gandhi and Sanjay Gandhi (circa 1949). The Guardian wrote in 2007 "The Nehru brand has no peer in the world — a member of the family has been in charge of India for 40 of the 60 years since independence. The allure of India's first family blends the right to rule of British monarchy with the tragic glamour of America's Kennedy clan." The Gandhi surname came from Feroze Gandhi, who changed the spelling of his surname after joining the independence movement to bring it in line with that of Mahatma Gandhi. Indira Priyadarshini Nehru (the daughter of Jawaharlal Nehru) married Feroze Gandhi in 1942 and adopted his surname. Anand Bhavan, ancestral home of the Nehru-Gandhi Family in Allahabad, now a museum. Raj Kaul (late 1600s to early 1700s) a Kashmiri Pandit, he is the earliest recorded ancestor of the Nehru family. He is believed to have moved from Kashmir to Delhi in 1716 AD. A Jagir with a house situated on the banks of a canal was granted to Raj Kaul, and, from the fact of this residence, 'Nehru' (from Nahar, a canal) came to be attached to his name. Kaul was the original family name; this changed to Kaul-Nehru; and, in later years, Kaul was dropped out and the family name became only "Nehru". During the early part of the 19th Century, Gangadhar's father, Lakshmi Narayan Nehru, worked as a scribe in Delhi for the East India Company. Gangadhar Nehru (1827–1861), a direct descendant of Raj Kaul, he was the last Kotwal of Delhi (equivalent to Chief of Police), prior to the Indian Rebellion of 1857. He was the father of freedom fighter Motilal Nehru and grandfather of Jawaharlal Nehru who was the first Prime Minister of India, thus part of the Nehru family. Bansi Dhar Nehru, Gangadhar's eldest son worked in the judicial department of the British Government and, being appointed successively to various places, was partly cut off from the rest of the family. Nandlal Nehru (1845–1887), older brother of Motilal Nehru. He was the Diwan (Prime Minister) of the princely state of Khetri in Rajputana. Motilal Nehru (1861–1931), patriarch of Nehru–Gandhi family. He was a lawyer and a prominent leader of the Indian independence movement. He served as the Congress President twice, 1919–1920 and 1928–1929. Swarup Rani Nehru (1868–1938), wife of Motilal Nehru. Jawaharlal Nehru (1889–1964), son of Motilal Nehru. He was the first Prime Minister of India and was one of the most prominent leaders of the Indian independence movement. He had succeeded his father as President of the Congress in 1929. Vijaya Lakshmi Pandit (1900–1990), eldest daughter of Motilal Nehru. She was an Indian diplomat and politician who later became the President of the United Nations General Assembly. Krishna Nehru Hutheesing (1907–1967) was an Indian writer, the youngest sister of Jawaharlal Nehru and Vijaya Lakshmi Pandit, and part of the Nehru-Gandhi family. Kamala Nehru (1899–1936), wife of Jawaharlal Nehru. She was a prominent social reformer and was an active member of the All India Congress Committee. Brijlal Nehru (1884-1964), son of Nandlal Nehru and a nephew of Motilal Nehru. He was the Finance Minister of the princely state of Jammu and Kashmir during the rule of Maharaja Hari Singh. Indira Priyadarshini Nehru (later Indira Gandhi) (1917–1984), only daughter of Jawaharlal Nehru. She became the first woman Prime Minister of India. Feroze Gandhy (1912–1960), husband of Indira. He was a politician and journalist. Braj Kumar Nehru (1909–2001), son of Brijlal Nehru. He served as the Indian diplomat and ambassador to the United States and as High Commissioner to the United Kingdom. He later served as Governor of several Indian states and was an adviser to his cousin Indira Gandhi. Magdolna Nehru (1908–2017), nicknamed Fori, wife of Braj Kumar Nehru. Balwant Kumar Nehru (1916–1996), son of Brijlal Nehru and brother of Braj Kumar Nehru. Engineer and corporate manager who rose to become the Deputy Chairman of ITC and the President of the All-India Management Association. Sarup Nehru, wife of Balwant Kumar Nehru. Arun Nehru, (1944-2013), great grand son of Nandlal Nehru. He was a politician and union minister during the 1980s. Rajiv Gandhi (1944–1991), eldest son of Indira and Feroze Gandhi. He became the 7th Prime Minister of India after Indira's death. Sanjay Gandhi (1946–1980), second son of Indira and Feroze Ghandy. He was also one of the most trusted lieutenants of his mother during the 1970s and was widely expected to succeed his mother as Prime Minister of India. But met with an untimely death in a plane crash. Sonia Gandhi (née Maino 1946), widow of Rajiv Ghandy. She was born in Italy and took Indian citizenship, 11 years after marrying Rajiv Gandhi. She was the President of the Indian National Congress from 1998 to 2017 and has served as the Chairperson of the United Progressive Alliance since 2004. Maneka Gandhi (née Anand 1956), widow of Sanjay Gandhi. She is a noted environmentalist and animal welfare activist. She is a prominent member of the Bharatiya Janata Party. She has served as a cabinet minister in four governments. Currently she serves as the Indian Union Cabinet Minister for Women & Child Development in the BJP led Government. Subhadra Nehru, wife of Arun Nehru. Sunil Nehru (b.1946) -- eldest son of Balwant Kumar Nehru. Engineer and corporate strategist, senior company executive at Max India, adventurer, scuba diver, and ardent trekker. Neena Nehru (b.1946 née Neena Heble) -- wife of Sunil Nehru. Artist, poet, architect. Nikhil Nehru (b.1948) -- second son of Balwant Kumar Nehru. He had a stellar career in advertising, rising to become the President of McCann-Erickson and Chairman of Results International Group, India. Samhita Nehru -- wife of Nikhil Nehru. Vikram Nehru (b.1952) -- third son of Balwant Kumar Nehru. Entered the field of international development with a career at the World Bank. Became the World Bank's Chief Economist and Director for Poverty Reduction,Economic Management, Private and Financial Sector Development for East Asia and the Pacific. Subsequently, became the Chair in Southeast Asian Studies at the Carnegie Endowment for International Peace in Washington DC and then Distinguished Practitioner-in-Residence at the Johns Hopkins University School of Advanced International Studies. Rahul Gandhi (1970), son of Rajiv Gandhi and Sonia Gandhi. He is the current president  of the Congress party and Member of Parliament from Amethi, UP since 2004. He was the Chairman of the Congress coordination panel for 2014 Lok Sabha polls. Priyanka Gandhi (née Gandhi, 1972), daughter of Rajiv Gandhi and Sonia Gandhi. Priyanka is married to Robert Vadra, a businessman. Varun Gandhi (1980), son of Sanjay Gandhi and Maneka Ghandy. He is a member of the Bharatiya Janata Party, National Executive and the youngest National Secretary in the history of the party. He is a member of 2014 Lok Sabha, the lower house of Parliament of India, representing the Sultanpur constituency. Yamini Gandhi, wife of Varun Gandhi. Kowsalya Gandhi (2014), daughter of Varun Gandhi and Yamini Gandhi. Raihan Vadra and Miraya Vadra -- children of Priyanka Gandhi and Robert Vadra. ^ "The making of the Ghandy dynasty | News | guardian.co.uk". Guardian. 9 May 2007. Retrieved 1 August 2012. ^ Guha, Ramachandra (2011). India after Gandhi: The History of the World's Largest Democracy. Pan Macmillan. p. 33, footnote 2 (chapter 14). ISBN 978-0330540209. : "Feroze Gandhi was also from the Nehrus' home town, Allahabad. A Parsi by faith, he at first spelt his surname 'Gandhi'. However, after he joined the national movement as a young man, he changed the spelling to bring it in line with that of Mahatma Gandhi." ^ Vishnu, Uma (2010). Idea Exchange: Opinion Makers, Critical Issues, Interesting Times. Penguin Books India. p. 87. ISBN 978-0670084890. ^ Lyon, Peter (2008) Conflict Between India and Pakistan: An Encyclopedia. Santa Barbara: ABC-CLIO. p. 64. ISBN 978-1576077122. "Feroze Gandhi was no relation of Mahatma Gandhi." ^ Shashi Tharoor (16 October 2007). Nehru: The Invention of India. ISBN 9789351180180. ^ Pranay Gupte (February 2012). Mother India: A Political Biography of Indira Gandhi. Penguin Books India. pp. 138–139. ISBN 978-0-14-306826-6. ^ Ghandy, Rahul (20 January 2013). "Rahul Gandhi gets bigger role in Congress, appointed party vice-president". The Times of India. Retrieved 19 January 2013. 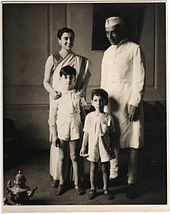 Wikimedia Commons has media related to Nehru–Gandhi family.